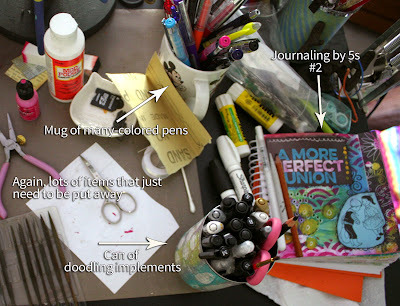 In my last What's on Your Workdesk Wednesday post, I showed you a picture of a neat, organized, two-project desk. Today. . .chaos reigns. There's so much going on that I simply labeled the pictures for you. 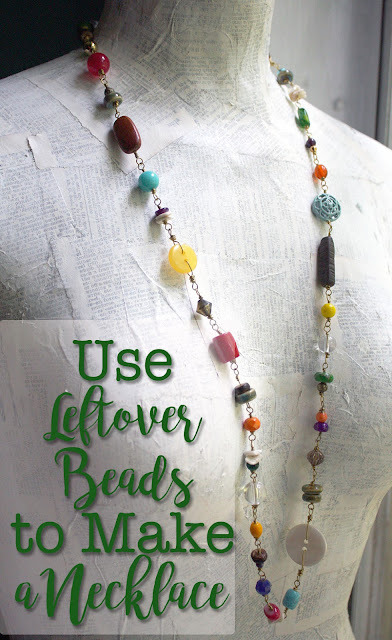 I've been a labeling madwoman; not only am I making jewelry and working on my second Journaling by 5s journal, but I'm in the process of reorganizing and sorting through the found objects and old jewelry elements I use in jewelry making. 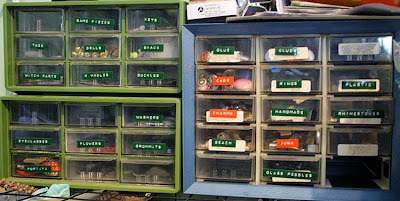 I spent a good portion of yesterday labeling organizers and picking through the bulk of my stash. Getting to sort through this stash and see exactly what I have has been so inspiring. I hope that mojo sticks with me long enough to get some items made, hence the chaos. 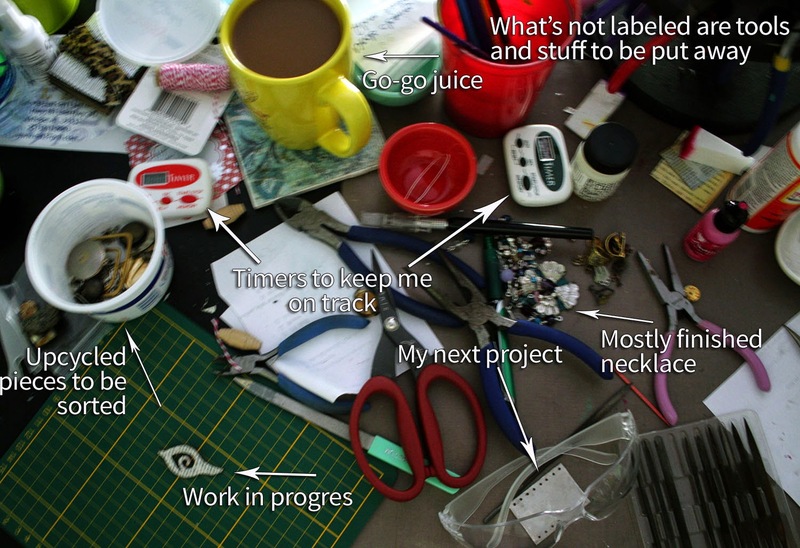 So, what's on your workdesk? I'm linking mine up to WOYWW at Stamping Ground. Julie, Oh yes! I love to sort through my stash. It never fails to inspire me in some way. I think that's when the mood to sort usually hits me too; when I just haven't been inspired in a while. Glad you liked the labels, it made it easier to point out everything going on. I appreciate you taking the time to pop in! Labeling and organizing is always so inspiring. I always want to stop in the middle of it all and make things! Instead I keep a notepad near and jot down all the ideas that come to me. Then that can be referred to when ideas aren't coming. Nice! I actually took a pic of my desk but since I knew I would never get it my blog, I just it on Facebook. Oh you are talking to the label queen here if it has a container then it has to be labelled otherwise I can handle it. You will be so happy when it is all done and will never look back. Happy labelling and happy crafting. You look extremely organised. I can only dream of such an occurrence ha! Ha ! 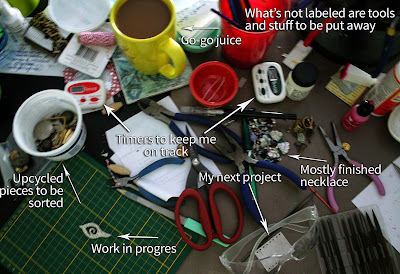 This is how my working table usually looks :) But it's different these days, because I'm working on some pieces for a contest (maybe) and there are only tools, wire and some crystals on my desk plus a couple of finished items :) But I miss the mess - I like to be able to see all my treasures around me when I'm creating!